We’ve all heard the expression that the veil in thinner now than it’s ever been. The veil separating the physical and non-physical worlds is what I’ve always thought this referred to. And it does. But it’s also more than that. Up till now, I’ve seen it as the separation of beings – physical and non-physical. Today, however, I saw this in a whole new way. The veil also covers our own perceptions and understanding of ourselves. It’s an internal thing – the separation between who I see myself to be from the perspective of ego which has been wounded and hurt and the perspective of my soul which looks at all experiences with benevolence, love and compassion. I clearly saw how denying what is true for me simply sets up an internal dilemma – which then plays itself out in external dramas and emotional upheavals. Admitting my truth to myself seems to be the first step in releasing this inner conflict. So this veil is not really so much about separating “worlds,” like I used to believe, as it is about separating perceptions. 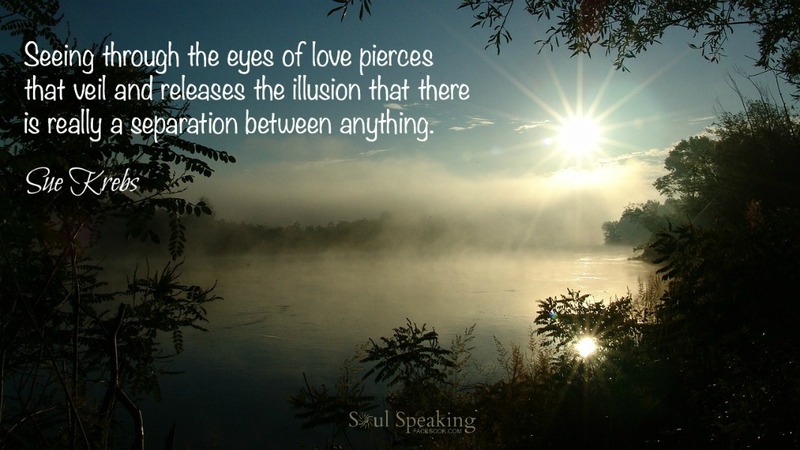 Seeing through the eyes of love pierces that veil and releases the illusion that there is really a separation between anything. Truly love is the energy that flows through everything, the energy that created stars, and the energy that makes us One – even as we play out different experiences from our unique ego perspectives. 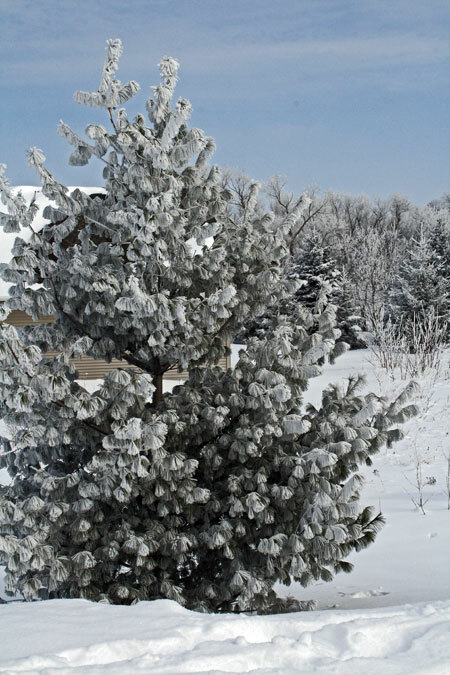 Occasionally, during the long winter months in Minnesota, atmospheric conditions converge to create the spectacular ice frost known as “hoar-frost.” When fog settles over the countryside and the temperature is just right, the water vapor begins to freeze to everything it touches. 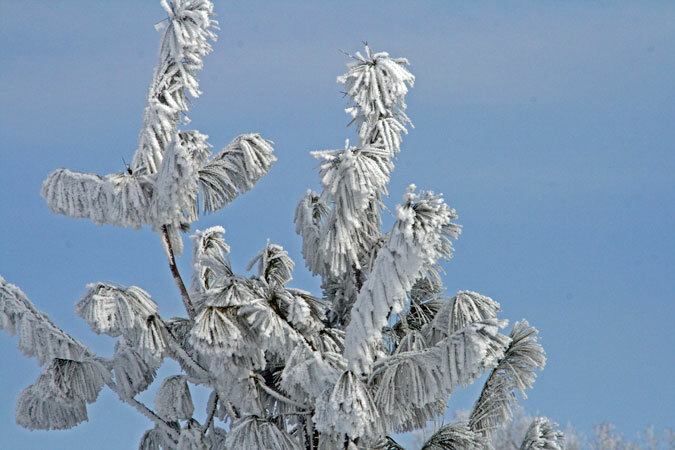 The ice crystals grow and grow until they resemble an icy lace, coating the edges of trees, bushes, plants and fences. The results are spectacular! Usually by mid-day, the fog lifts to be replaced by a brilliant blue sky. The contrast of these large crystals against the winter blue sky is nothing short of breathtaking. Just the day before this magical winter display, I experienced a personal moment of crystal clarity. It was one of those “AHA” moments of such magnitude that it stayed with me throughout the next day. Lately, I’ve wrestled with a relationship that has left me feeling used and taken advantage of. I’ve struggled with feelings of hurt, resentment and abandonment. And my feelings were complicated by the fact that my friend had unknowingly created this situation whirling around and around in my head. I knew she had not intentionally hurt me, but knowing this didn’t make me feel any less wounded. After finally writing pages and pages in my journal to validate and release my pain, I was blessed with a knowing deep within the core of my being. I KNEW I was loved, whole and complete. But this was so much more powerful than simply knowing this in my head. I experienced this knowing in every cell of my body, in every dimension of my being. In that moment I felt God – and it was utterly amazing, breathtaking, and astounding. I’ve never felt such deep peace and love and contentment. I realized that everything that I’d been seeking from my friend was already there inside me. I did not need anything from anyone because I was complete, whole. It occurred to me that my relationships are not to give me something but to show me what I already have through my connection to God, to Source. This feeling of complete-ness stayed with me into the next day. I saw the world through eyes of love and non-judgment. People shined with joy, the world shimmered with love (and a beautiful display of hoar-frost). I feel blessed to have been granted a taste of seeing life from this heart-centered place. By being connected to this Source of Love, I felt above, unaffected by, the dramas of daily life. What an amazing experience! The most astounding part of this experience for me was seeing that the words we study create an intellectual experience of love, acceptance, One-ness. What I felt was not a thought but an immersion in the concept – every cell of my body knew and resonated this love. People I met that next day, friends I haven’t seen in years, commented that I looked fabulous. I know, however, that they weren’t seeing me. They saw my Spirit basking in the new-found place of love. What a holy moment – this moment of crystal clarity, this understanding of the Love which we are. I am ever so grateful for this experience of being love. I now believe that this is the state in which we strive to walk every day. 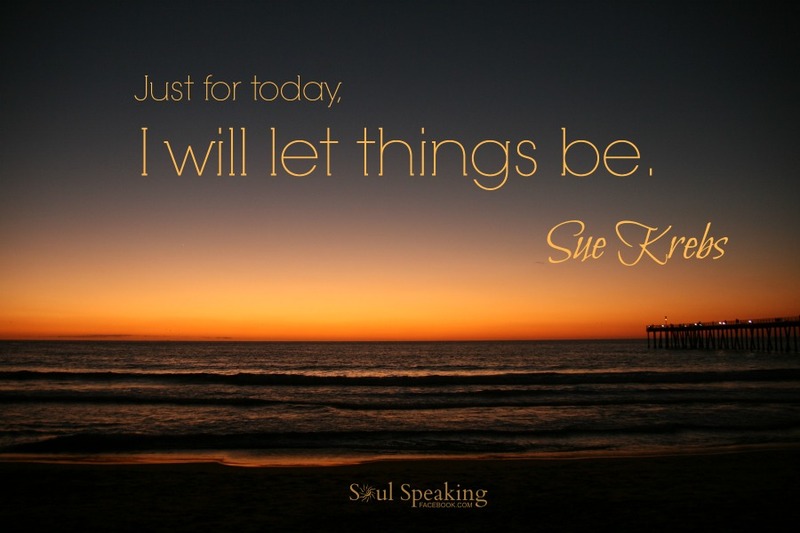 From this place of love, truly all things are possible.